We will talk about how we can deploy BranchCache. First all workstations should be running supported version of Windows. The content server (your IIS or File Server) should be running BranchCache supported version of Windows Server. After that, we need to install the optional “Windows BranchCache” component on the Windows web or file server on the main site (Content Server). This can be done by going to Add Features and choose “Windows BranchCache” component for web servers, or “if we are talking about file servers”, by going to File Services from Server Manager, choose “Select Role Services” and click “BranchCache for network files”. For BranchCache clients to operate on a distributed cache mode, a GPO should be applied to configure the clients to act as BranchCache clients. We can also configure the percentage of disk space that BranchCache files will consume on the local disk (by default 5%). 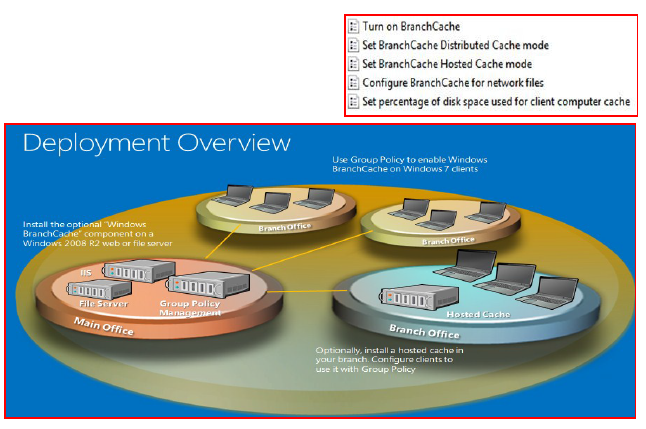 For BranchCache in Hosted Cache mode, we need the Hosted Cache server to be running supported version of Windows. This is a big limitation as you need to license an Enterprise Edition of Windows for the branch Hosted Cache server. The Hosted Cache server also requires a digital certificate so that clients can authenticate it before downloading cache content. BranchCache group policy is the best way to configure clients to use this technology. A client can only be operating in either Distributed Cache mode or Hosted Cache mode but not both. The below figure shows how GPO can be used to enable BranchCache on clients and choose the mode of operation. If Hosted Cache mode is selected, then you need to type the FQDN of the Hosted Cache server existing in the branch. You can also set the percentage of the local disk that can be used for cache content in case you are using Distributed Cache mode.